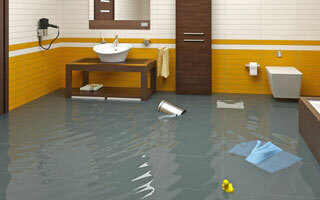 Almost every plumbing problem is an emergency, or can soon become one. It may be as simple as a dripping faucet, or as much as a broken pipe in the wall. What should you do? If it is clear water from the water supply, it will be under a lot of pressure and spray a stream of water. Step #1, turn off the main supply valve, usually located outside or in the basement. Step #2, pick up the phone, and call Knoxville Plumber. If it is waste water, sometimes called grey water, it is only under gravity pressure from an upper floor, so there is no spray, but more of a slow rising of waste water coming up the drain, into the a tub or shower. Step #1, quit running water in sinks and baths, and do not flush toilets. That just makes it worse. In either case, the important thing is to stop the flow of water, whatever its source. In the case of fresh water, shutting off the main valve for the house will stop all flow into the house. Once done, there will only be the water in the pipes, and if you open several faucets, that will slowly drain out until the pipes are empty. With the water shut off, you will have time to consider your situation, and what your options are. In the case of wastewater, if only one sink or toilet is plugged, use a plunger to try to free the plug. If everything is plugged, it is probably in the drain line outside the house and underground. This will require a motorized “snake” to be sent down the cleanout trap, located just outside the house. Now is the time to call a professional. The snake has sharp cutters to cut through roots and the debris that is probably piled up behind them. With the roots cut out, and the debris removed, the house drains will suddenly flow freely. To prevent this from happening, many people have their drain line cleaned yearly, especially if the pipe is old and there are trees in the yard. After your emergency is under control, and you are looking for a Knoxville Plumber, we would encourage you give us a Call Today! Why Is It Taking So Long For The Water In My Home To Heat Up Why Install a Water Softener?